Here's a gift horse you're going to want to look in the mouth. Microsoft is holding an event today for Windows 10, and they just revealed that Windows 10 will be available as a free upgrade when it launches later this year. Any one who is running Windows 7, Windows 8, or Windows Phone 8.1 will have the option to install Windows 10 for free any time in the first year after Windows 10 is launched. That sounds like a great offer, so I would bet I am not the only one wondering what the catch is. Microsoft makes a pretty penny off of upgrade and license fees, so we need to understand why they're willing to give it up. Do they have some other plan to extract pay per use fees from Windows 10 users? 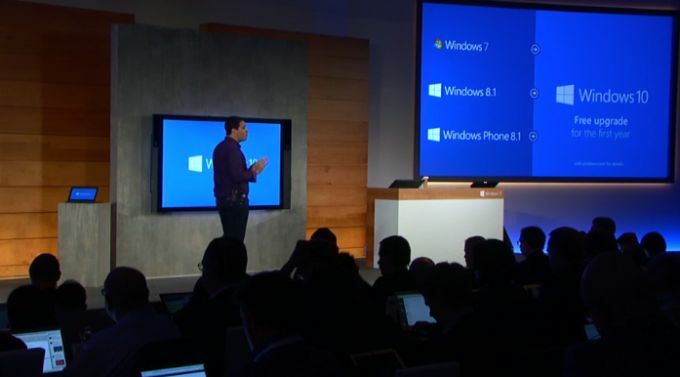 Microsoft has said that they think of Windows as a service (as opposed to an app) so it's not out of the question. Or is just that Microsoft wants to fight that the conventional wisdom that one doesn't upgrade to a new version of Windows until after the first service pack? Whatever Microsoft is planning, I plan to avoid Windows 10 for the near future. I just got a new laptop with Windows 7, and it should be good enough to last me the next 3 to 5 years. With luck I'll be able to avoid the inevitable teething problems that Windows 10 will bring. It’s not as big a thing as you might think to offer a free upgrade to Win 8 users. Windows 8 only has about 10 percent market share. New Windows 7 disks are still outselling Windows 8 at retail. Microsoft is really trying to get Win 7, Vista and even Win XP users to upgrade to Win 8, then Win 10. Most people never upgrade the OS on their computer anyway, they keep it until they replace the computer. they should give a free upgrade to people with vista also, they’ve suffered enough. Indeed. There are hardly any user left, so there’s not much to lose. And since many are using hardware powerful enough to run Windows 7, they should be able to run Win10. As a long time Apple fan, I must say I take great enjoyment in seeing Microsoft painfully fade into oblivion as step by step all their revenue sources fade. First, they had to makes apps like internet browsers free. Then offer Office for the iPad free. Meanwhile, they’ve had to lower prices on the system software they provide to computer manufactures to compete with Chrome and Linux. Now they are giving away free system updates. And people debate whether to even take them. Yes, a bright future ahead for the king of software. While Apple gets everyone to pay for OSX system updates. I’m not criticizing, just amused by the contrast. But to be nitpicky, MS only made their web browser free because by the time they released one MS had already lost the market. Or at least that is what it looked like at the time; the number of web browsers in use now absolutely dwarfs the number of Netscape Navigator installs when IE 1.0 launched. Actually, Apple was been ahead of Microsoft, as usual. It’s been lowering the price of major updates consistently. It was $129 for the original OS X 10.0 (2001) and only $29 OS X 10.7 Lion (2011) and then $19.99 OS X 10.8 Mountain Lion (2012). Their last two updates, Mavericks and Yosemite were free. I’d bet for sure this trend was deliberately aimed at undermining Microsoft’s ability to charge for it’s own updates. Also, I sure Jobs thought about Microsoft when he created the App store an made it easy for anyone to sell apps (first for the iPhone and then for the Mac). It was another way to undermine Microsoft’s advantage in Windows software availability. The app store has pretty much killed retail software sales where Apple had a huge disadvantage. Not to mention Apple is now giving away Pages, Numbers, Keynote and other key software. (Doesn’t hurt that Google is giving software away for free either). All that being said, I actually think this new guy running Microsoft, Nadella, has a clue. So I’m curious to see where they go from here. Balmer almost killed the company. okay, that would explain the MS news today. Actually MS owns part of Apple. It’s a weird kind of irrelevance Microsoft is supposedly fading into. Their profits and revenue are at all time highs. MS profits declined last quarter by a small amount. But more importantly, between 2004 to 2014, Microsoft total revenue grew from 36.8 billion a year to 86.8 billion. So it’s not going away. However, the global market for technology is rapidly expanding and Microsoft is shrinking compared to other big players. Like, for example, Apple, which was given up for dead not long before because no one could beat Microsoft. However, from 2004 to present Apples revenue went from 8.2 billion a year to 182.8 billion a year. Apple brings in much more than twice Microsoft’s total revenue and is growing far more rapidly. Microsoft’s domance on the industry is completely broken. There was a time when businesses were terrified Microsoft would decide to compete with them. No one is terrified anymore, many companies beat them in key growing areas, and Microsoft is struggling to remain relevant in key sectors. That’s what I mean by irrelevance. MS got into browsers because they saw browsers evolving into a software platform that could span multiple hardware families and thus displace Windows so they needed to be in that game. That is where the whole “embrace and extend” (with native OS features) came in, to prevent Netscape from defining the web programming interfaces. Internet Explorer fully succeeded at that. HTML5 apps is the kind of stuff MS saw happening. Wonder if free upgrade means subscription based after? That’s where MS is pushing Office users, so there’s a chance that Win10 users might get a similar push.